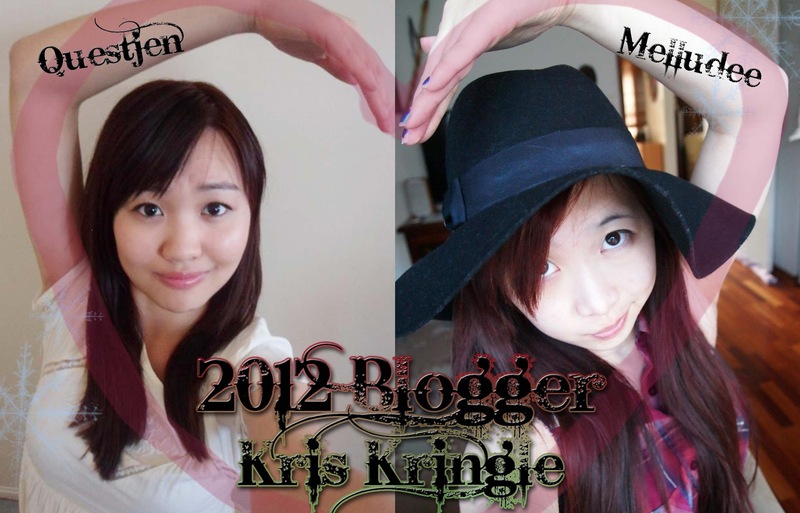 QuestJen: 2012 Aus Blogger Kris Kringle! 2012 Aus Blogger Kris Kringle! It is once again proudly hosted by yours truly and my good friend Melody (Melludee)! We didn't feel the need to make any changes so it's exactly the same as last year. The rules and the details (please don't mind the copying and pasting from my post last year ^^). Everyone who participates will have a KK, yay! Part 2 of this comic strip is on Melody's blog here! 1. This is open to AUSTRALIAN blogger residents only, with a legitimate Australian postal address. I have to make this clear to avoid confusion and invalid entry submissions. And sorry that it isn't international, it's just that it makes it more fair with shipping costs and package arrival times. Also, you must have your own blog! This is to avoid delays, because during the Christmas period is where most packages are sent! 4. Have your name/blog address written on a card in the package to send off! Just so they know who sent it! Entries must be in by November 11.59PM (AEST) 25th of November 2012 so that we can sort out the KKs for everyone by the 26th of November. Be sure to check your emails on the 26th of November to find out who your KK is, as either myself or Melody will be emailing you with your KK's details and what they would like to receive as their present. DISCLAIMER: Your postal address will not be shared with anyone apart from the person buying the present for you. If there are any questions or concerns, please don't hesitate to contact me or Melody via email/comment!